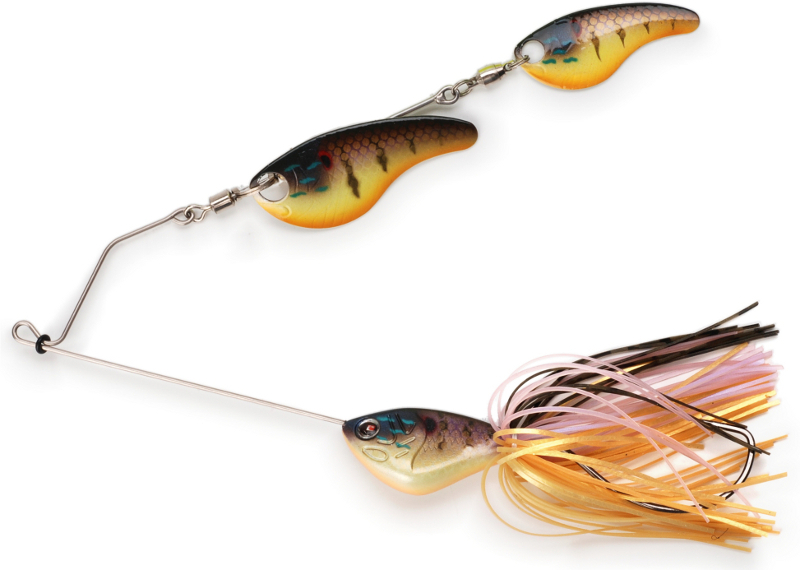 The Pro-Shad Spinnerbait Finesse body and blades are made to look alike. Thanks to their similar shape and finishes, the body and blades truly appear as a small school of baitfish. The larger front blade is mounted on the wire with a custom-designed, specific clevis of a big diameter to give the blade more eccentricity from the axle of rotation for more reactivity and to move a lot of water without pulling hard on the rod. The smaller back blade is mounted with a ball bearing swivel for 360 degrees of independent freedom from the arm. Both blades turn as soon as they hit the water. Use breaks in the retrieve, let it free fall, and both blades still turn. There's never down time when one blade's not working. Its stable balance also permits the angler to burn it fast. Both blades constantly create lots of turbulence and extremely realistic baitfish flashes and silhouettes at any speed from ultra slow to super fast.